Many people feel that screen capture is something that is only useful for professionals who are intent on producing video guides or presentations. While that is partly true, the fact of the matter is that even normal users can benefit from it in numerous ways and use it to record Skype calls and online streaming video, or even save live webinars for later viewing. The only thing you need is screen capture software – and if you’re using a Mac then the Movavi Screen Capture Studio for Mac is definitely worth a look. The main advantage that the Movavi Screen Capture Studio for Mac is that it blends numerous powerful features with a user-friendly approach. In other words, you’ll be able to utilize professional-level features with minimal hassle because they are all designed to be intuitive and easy to grasp. When you record footage from your screen you can choose whether you want to highlight the mouse cursor as well as display keyboard actions on the screen. That way viewers will be able to ‘see’ what is going on more clearly. Should you want to enhance the quality of your video or even trim unwanted footage from it, you’ll be able to do so with the editing tools provided. On top of that you could also cut and combine various segments of video as is needed. Aside from being able to capture audio from any source while recording, you can also choose to insert an audio track after the recording is done – which is perfect for adding background music or anything else for that matter. 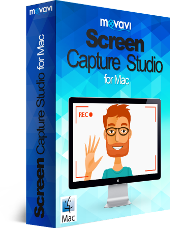 In a nutshell, the Movavi Screen Capture Studio for Mac is a complete screen recorder and editing studio that will give you everything you need to produce high quality and professional-looking videos. Assuming you want to go into screen recording for Mac, for whatever purpose, it is going to be able to do everything that you demand of it and more. The best way to see what it is capable of is to try it out for yourself so get a firsthand feel for how easy and powerful it is.